There are very few incidents of equipment failing underwater, but it’s sensible to consider what can go wrong. If you do experience a problem, your training should mean you take it in stride. If your mask is continuously flooding, either the seal of the skirt is damaged or the frame is broken. If this happens to you on a dive, you just have to clear your mask as often as needed until you reach the surface. To avoid this situation, some divers carry a spare mask in a BC pocket. Regulators rarely fail, but it is possible. Sometimes, a hose has become old and brittle and breaks, gushing air. If this happens, you should use your buddy’s alternate air source until you can get to the surface. Otherwise, make a free ascent, keeping your airway open all the way. If your regulator has developed a small hole in the mouthpiece and is letting in water, it will make your breathing damp but you’ll probably be able to finish the dive. If not, pull off the mouthpiece and insert the metal or plastic stump directly into your mouth. Faulty tank O-rings tend to blow when they have the most pressure on them, either before or early in the dive. If this happens, you will usually have time to abort the dive. If you are diving in cold, fresh water and your regulator starts to free-flow uncontrollably, you should continue breathing from it but allow the excess air to escape harmlessly into the water. You should abort the dive immediately. It is sensible to practice what to do in this situation in the controlled conditions of a swimming pool. If the dump valve on your BC sticks open, you have a serious problem and should abort the dive immediately by swimming to the surface. You should be able to do this easily if you are not carrying too much lead. If you lose your weightbelt, you will start a buoyant ascent immediately. To slow yourself down, lie horizontally and flare your arms and legs. Keep your airway open, shouting “Arghhhh!” if need be. A leak in your drysuit means you will get cold, but your BC will help maintain your buoyancy. Contrary to popular belief, a flooded drysuit weighs nothing underwater. However, it does make climbing a boat ladder difficult because of the weight of water in it. Should your computer fail to work, stay close to and slightly shallower than your buddy. Never go deeper than your buddy. You can use your buddy’s computer to help you get safely to the surface. Many divers now carry a second backup computer that will be up to date with their decompression status, ready for the next dive. Another potential problem is if the camband of your tank is not sufficiently tight. If this happens, show your buddy that it is dropping out so that your partner can push it back and tighten the strap. If your buddy runs out of air, offer them an alternate air source and abort the dive. Obviously, if you run out of air, your buddy should do the same for you. It is important to practise sharing an alternate air source in a swimming pool. 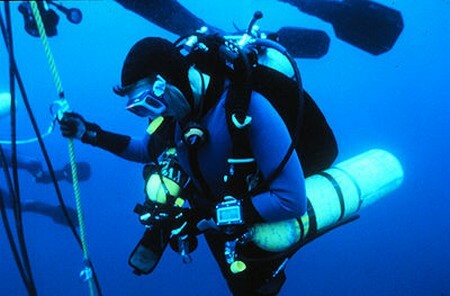 Some divers carry a spare 3-L (16-cubic-foot) cylinder of air with its own independent regulator. This is often known as a pony. It is vital to be well practised in your rescue skills so that you will be able to cope with any emergency.